I bought a new camera just before Christmas. It is a beautiful Fuji X10. I say it's beautiful because it's styling is very reminiscent of the Leica range finders from the 50's and 60's. This camera has clearly been designed by someone with and eye for the aesthetic, and how can that not appeal to a photographer. It is small, fast and light, and the image quality is excellent. 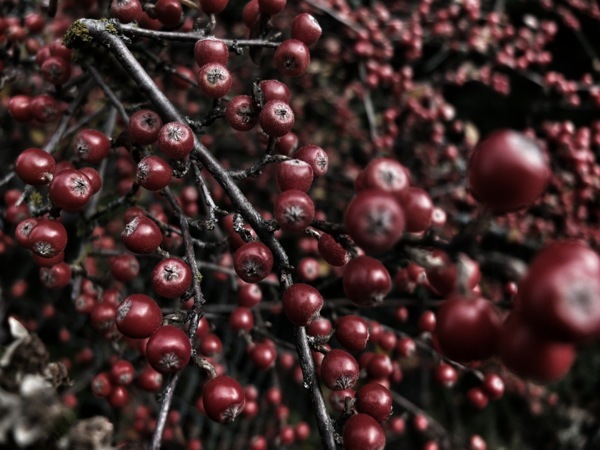 I was walking past the hospital the other day and I saw these berries sitting on bare branches and the image was so evocative of the harsh realities of winter amidst which we have the joy of Christmas. I stopped pulled my new X100 from my purse and snapped off a few images. It lifts my spirit just a little bit to do something creative, even if it is just a small thing, in the midst of a difficult time. It is interesting to me to see the way that my creative impulses can affect my mood. Anyway, after I got home I pulled these images into my iPad and applied a very nice filter to them that helped to accentuate the mood i wanted to evoke in the image. I used a very good images editing app called Snapseed. I highly recommend it.